The most amazing heroine in the city needs to look good while she fights evil and defends the innocent. 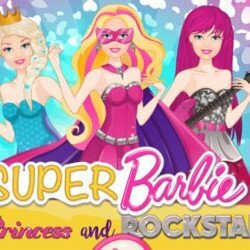 Super Barbie is a great fashionista and she loves fashion as much as the next girl. She wants to look super cute today and she is ready for the best makeover. Can you help her? 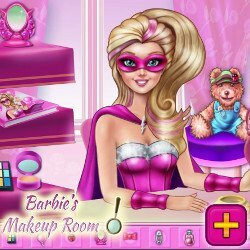 Don’t waste any time and begin the game called Barbie Superhero Makeover and help her look like a strong and powerful girl. Start the makeover with a facial prep. Use tweezers to remove the unwanted hair from her eye brows and reshape them. Use a concealer to remove the dark circles from under her eyes and a a foundation to cover the redness around the nose and the ugly blemishes. 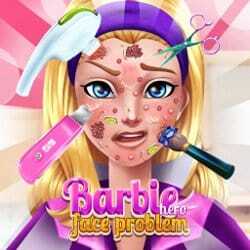 In Barbie Superhero Makeover the next step is to apply the makeup. Try a gorgeous pink shade of the lids and a cute red lipstick. Another good idea is to apply a blush to bring some color to the cheeks. 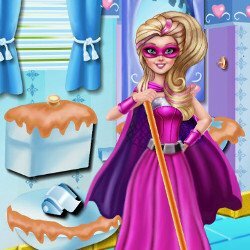 For her outfit, you can try many glam dresses and fun outfits with gorgeous details and sparkly applications. Try a purple dress and add a nice mask around her eyes.